In the previous post in this series, we looked at the TOP FIVE FIBA Asia Centers. These are the beanpoles who are expected to anchor the interior offenses of their respective teams and serve as the last line of defense in case the perimeter defense cracks. In this issue, we’ll look at maybe the most peculiar position in basketball – the power forward position. I’ve always felt that his position was a little too overstated. I mean, just look at its name – POWER FORWARD. The first time I heard that term was way back in fourth grade when one of my classmates announced that he was officially the class basketball team’s POWER FORWARD. What the hell did that mean – that he could never step back over the timeline on defense? And what kind of power did he actually have? Could he leap from one free throw line to the other in a single bound? In reality, however, playing PF might seem absolutely confusing, if not utterly schizophrenic. A PF, in the traditional sense, is smaller than the center, but a little bigger than any of the wingmen. He is not really supposed to man the middle, but he should be inside. Typically, he is not the first option in the low block, but he would do well NOT to shoot from way out, too. In short, many times, a PF is neither here nor there. It’s a position built for people who like impersonating headless chickens whose main goal in life is to just jump and get repossessions. Dennis Rodman, Reggie Evans, Malik Rose – ring any bells? Of course, there have been a plethora of basketball greats who were PFs, like Karl Malone, Charles Barkley, Kevin McHale, Kevin Garnett, and Othella Harrington (What? He isn’t on your list? You’re kidding, right?). Still, it’s perhaps one of the toughest positions to fill simply because a PF, again, is expected to possess the skills of both a center and a small forward without being “too much” of either position. This is, I guess, why guys like Keith Van Horn and Tim Thomas never really could find their “identity,” because PFs, by nature, have nebulous roles. It is no surprise, then, that these muddled responsibilities and varying skill sets are present in Asian PFs. It is with this context that, here in Part 2 of our series, we look at the TOP FIVE FIBA Asia Power Forwards, and then make some recommendations for which locals could be viable match-ups against these marquee Asian cagers. Please take note that some of these 4s actually play either the small forward or center spot at times for their respective teams. Again, this should not really come as a surprise. KBL last season, is one of the top PFs in Asia. 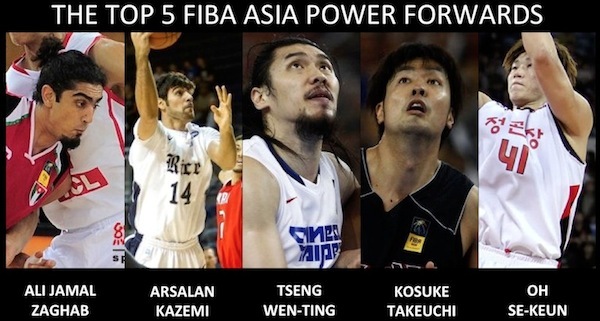 These are the best power forwards in Asia! Strengths: Zaghab is the Anderson Varejao or Joakim Noah of Jordan. He’s not a big time scorer, but he’s a scrappy fellow who gets down and dirty in the trenches. He doesn’t really have polished post moves, nor can he face up to hit the mid-range J, but what he lacks in offensive prowess, he makes up for in spades with his big man D and hustle. Despite being an aggressive defender, he also rarely gets into foul trouble. Weaknesses: Given his skills, Zaghab is far from someone who can take over a basketball game. He tends to have trouble from the line, too – he averages under 50% in most of his stints with the Jordan NT. 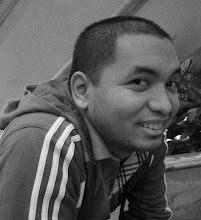 He is also not as versatile as former Jordan stalwarts Zaid Al-Khas and Ayman Idais. Strengths: Kazemi is an explosive power forward who served as the perfect complement to Hamed Haddadi up front for Iran in the 2011 FIBA Asia tourney. 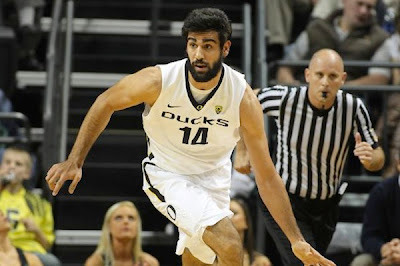 He transferred from Rice University to the University of Oregon this year in US NCAA, and, despite the higher level of competition, he still averages a near double-double for the Ducks. He is an extremely efficient big man, norming great numbers in Wuhan by just playing barely over 20 minutes per game. And, yeah, he’s just 23 years old!!! Weaknesses: The biggest knocks on Kazemi are his free throw accuracy and around-the-basket defense. He shot under 60% from the line in the 2011 FIBA Asia joust, and shoots just a little over it in the NCAA. For a guy gifted with his size and athleticism, he also doesn’t block a lot of shots, though one may argue it’s because Iran has Haddadi for that anyway. on the Oregon Ducks this year. Strengths: Tseng is the classic international big guy who possesses great low post play and great outside shooting. He’s like Taiwan’s Tim Duncan, if Duncan added a dangerous shot from beyond the arc. His stats with Shanghai aren’t impressive, but that’s really because the Sharks have two other bigs ahead of Tseng in the rotation – DJ White and Chinese NT slotman Zhang Zhaoxu. Tseng has always been a thorn on our side, and his great combo of shooting and mobility should continue to serve the Taiwanese well this year. Weaknesses: Tseng didn’t shoot well from the floor in Wuhan (under 40%), but he rebounded from that by shooting nearly 60% in the 2012 Jones Cup. What’s consistently awful about him, though, is his inconsistency from the free throw line. He norms around 60% from the stripe, and that is definitely not good for a guy who likes to operate down low and who gets hacked pretty often. He has decent on-ball post defense, but he’s not exactly the most intimidating shot-blocker out there. Also, he’s already on the wrong side of his 20s. Strengths: Takeuchi has always been known as a versatile big man. He is capable of operating from the low block either with his back to the basket or facing his defender. Like Tseng, Takeuchi can also hit the occasional jumper and is a pretty good passer. Weaknesses: One big weakness for Takeuchi, however, and this is one big reason JR Sakuragi was called up to the NT again, is that he’s a little… soft. 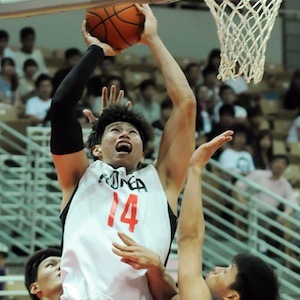 Takeuchi has enough athleticism to get rebounds and block shots, but he’s not exactly a guy who can impose his will on either end of the floor. He has also been known to fade if things get a little too physical down low (like what happened when Gilas faced Japan in Wuhan). Another weakness is his inconsistent free throw shooting – he shot 90% in the 2012 FIBA Asia Cup, but is currently hitting at a dismal 52% clip for Toyota Alvark in the JBL. Strengths: Many people can still remember how Oh, as a spry 22-year old, dropped 31 points on Powerade Team Pilipinas during the battle for 7th place in the 2009 FIBA Asia tourney in Tianjin, China. Not much has changed with Oh in terms of his skill set. He’s still the most dangerous interior operator for the Koreans, despite the fact he’s probably their smallest PF/C guy. He’s actually just as tall as most of our own “big” men in the Philippines, but he just seems to utilize his gifts of quickness, shiftiness, and timing a little better than most other Asian forwards. Oh is dangerous from as far as 20 feet out and is famous for finding openings in opposing teams’ defenses. Weaknesses: Other than his inconsistent free throw shooting, Oh really has no statistical weakness. One thing that might slow him down, however, is the fact that he is still recovering from his lingering knee and ankle injuries. He has missed practically the entire 2012-2013 KBL season so far, and it looks like he might not return anytime in the next couple of months. Still, if, indeed, Oh does make a comeback, then there will almost definitely be a prime spot in the National Team reserved for him. There are really two general kinds of Asian PFs – those who are physical and really fight like mad dogs underneath the basket (Zaghab and Kazemi), and those who prefer the finesse game by utilizing their quickness and midrange game (Tseng and Takeuchi). Of course, there’s also the anomalous PF who is a fair combination of both power and finesse, and that’s why Oh Se-Keun is, by far, the most dangerous power forward out there. That is, of course, if he is in the pink of health. I feel that, at least in terms of skill set, most of our own prototype local big men can match-up pretty well with any of the guys mentioned above, but one factor that will really make Gilas Pilipinas a little dehado when it comes to the 4 position is size. Whereas other countries can afford to have guys standing 6’8” or taller to play power forward, coach Chot Reyes will probably have to make do with guys standing 6’4” to 6’7” only. One can make the argument, of course, that Marcus Douthit can slide into the 4 position with the addition of both Greg Slaughter and June Mar Fajardo to the team. The prospective power forwards of Gilas should be players gifted with the kind of grit and physicality we Pinoys are known to have. Ideally, however, that should be balanced out by the capability to spread the floor by virtue of polished perimeter shooting or well-timed cutting. In PART THREE, we shall take a look at the TOP FIVE FIBA Asia Small Forwards. 1 thing common about the 5, POOR FREE THROW SHOOTERS. or I would just say INCONSISTENT from the line. hope we can sustain to defend and limit those guys. 2) the kazakhs are having trouble forming their own team, since there seems to be internal squabbles with their own basketball federation. still, you're right, IF the Kazakhs join the tourney with their best team, then Ponomarev will surely be a big thorn on our side! how about Zaid Abbas? is he really going to retire from Jordan NT? How about china's Yi jianlian? I counted Abbas as a SF, though he does play PF sometimes for JOR. The thing with Abbas is I won't even include him in the Top 5 SFs because he already indicated his retirement from international basketball, at least for now. I counted Yi as a C because that's what he'll probably play as in the August tourney (with Wang Zhizhi out). CHN's main PF will probably be either Zhu Fangyu or Ding Jinhui. Oh Sek-eun might miss this year's tournament due to a ruptured ligament. His possible replacement, Kim Min-soo, is no slouch, though. Based on what I've read in the forums, I think Oh's recovery is going well and he might be ready to compete in August. If, indeed, he won't make it, then I don't think Min-Soo will replace him simply because Korea's basketball governing body is very strict when it comes to using "half-Korean" players. It'll be a toss-up among Min-Soo, Lee Seung-Jun, Lee Dong-Jun, and Moon Tae-Jong. Also, it's actually Oh Se-Keun. Oh Sek-Eun is the inaccurate name used by Asia-basket.com. If you look at Oh's Korea NT jerseys, his name on tieback is ALWAYS OH S K… trivia lang. Also, strangely enough, he's my Facebook contact and it is Oh Se-Keun. I hate how Asia-basket.com can be so inaccurate (and to think I write for them! haha).